The Tennessee Titans handed the Dallas Cowboys their first home loss of the season, running away with a 28-14 victory in the NFL on Monday. Both teams entered the game with 3-4 records, were coming off a bye week, and had lost their most recent games on the final possession. But, what ensued at AT&T Stadium was an exciting game between two teams fighting to get to .500. It was filled with all the usual components: big runs, bigger throws and even bigger names. There were also a few head-scratching turnovers on both sides that kept this game close through three quarters. Receiver Amari Cooper made his Cowboys debut with quarterback Dak Prescott and company and there was also a vintage performance from Titans quarterback Marcus Mariota, who had been struggling to get Tennessee's offense fired up. It was a tall task for the 2014 Heisman Trophy winner. While the Cowboys did not have a winning record, they certainly had home-field advantage. But, that did not stop Mariota from returning to his old ways. He showed off his arm, his legs and his ability to make big plays, including leading his offense to conversions on 11 of their 14 third downs. Mariota did all of this without momentum on his side. He entered the game with just one touchdown pass in his last three outings and threw just three scoring passes in his last six games. He finished Monday with two touchdown passes. He also registered his highest QB rating of the season (119.9) and second-highest completion rate (72.4) after connecting with his receivers on 21 of his 29 passes. Mariota tallied 240 passing yards in the game. Neither quarterback could keep the ball out of the hands of their respective opponents. Mariota fumbled and lost the ball twice, while Prescott threw an interception and fumbled the ball, which the Titans recovered. Both teams took advantage of the turnovers, scoring on all but one of the ensuing possessions. 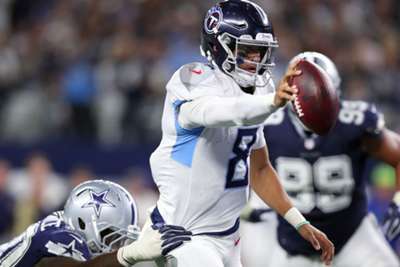 Dallas came away with seven points, but it was Tennessee that ended up winning the turnover battle as the Titans scored two touchdowns off the takeaways. It was Prescott's 10th game with multiple turnovers in the last two seasons. On the other end, the Cowboys' defense upped their takeaway total after entering the game with just six – only the San Francisco 49ers had fewer (five). The two-time Pro Bowl player had a big goal in his debut in Dallas. The former Raiders receiver wanted to prove the Cowboys were right when they acquired him two weeks ago. He certainly did that with his first touchdown as a Cowboy. Prescott found Cooper, the fourth overall pick in the 2015 draft, for a four-yard score that gave Dallas their first points and an early lead. Sideline angle of @AmariCooper9's FIRST TD with the @dallascowboys! In his first game with Dallas, Cooper equalled his scoring output with the Raiders, where he had just one touchdown on 22 receptions. He finished Monday with the score and 58 yards on five receptions.